This winter, why not load your backpack, grab some friends and hit the trail for a sleepover in a backcountry yurt. Miles away from the hustle and bustle of a city, Idaho has dozens of cozy yurts to call home while exploring marvelous mountains. From quiet cabins to hot-tub ready huts, check out some of the best winter yurts in Idaho. Find your winter playground at Winchester State Park. Photo Credit: Idaho Department of Parks and Recreation. Several Idaho state parks include yurts in their lineup of overnight lodging options. Many of the yurts sleep up to six people, are accessible by vehicle and are equipped to withstand all sorts of weather conditions. These are an excellent option for those looking for a unique outdoor experience without going too far off the grid. Find out more about reserving a yurt here. There are four yurts located in Winchester State Park: Tamarack Yurt, Ponderosa Yurt, Lodgepole Yurt and Snowberry Yurt. Each yurt can sleep up to five people, allows dogs and has at least one designated parking space. Make sure to book at least 48 hours in advance! While you’re in the area, check out the nearby Wolf Education and Research Center to learn about the area’s wolves and their habitats. Tours are free for kids under age six! Call ahead to reserve your spot. Take the family on an unforgettable winter camping trip at Cygnet Yurt or Wyethia Yurt in eastern Idaho’s Harriman State Park. Each yurt is outfitted to sleep up to six people with two bunk beds, a picnic table, wood-stove, propane cooking stove, and lantern. Drinking water, firewood, and a vault toilet are located just outside the yurt. Be prepared to pack in flashlights, sleeping bags, water containers, food, camp cookware, propane, and most importantly, don’t forget to pack your snow gear for unforgettable winter adventures. Designed to accommodate a crowd, Osprey Point Group Yurt Camp features three yurts that can house up to 30 people. Two yurts share one deck with the third yurt on an adjacent deck, leaving a common space for vehicles and gear in between. Each yurt has basic equipment like a wood stove, drinking water, and bunks. For a day trip that is equal parts fun and relaxing, check out Gold Fork Hot Springs located just outside the park in Donnelly. 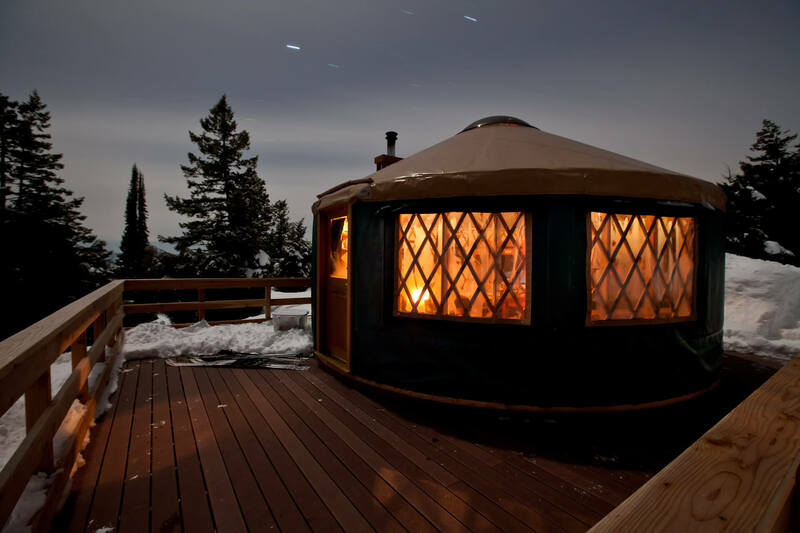 Escape to a cozy yurt at Galena Lodge. Photo Credit: Galena Lodge. Galena Lodge in Ketchum has four on-site yurts available for guests looking for a unique winter escape. Yurt dwellers can also enjoy the wood-fired sauna to unwind and warm up after a day of playing outside. For those looking to up the game on creative culinary experiences, you can even have a hearty and delicious dinner delivered right to your door (you must arrange this in advance). If you need to get out of the snow for a day, make the short trip into Sun Valley for a horse-drawn sleigh ride or an afternoon ice skating at Sun Valley Resort. Located at the southern end of the high ridge above Galena Lodge, Senate View Yurt is perfect for a family getaway due to its close proximity to the sledding hill and main lodge. The yurt can sleep up to eight people and is equipped with essential amenities. It is next door to Star’s Perch yurt, making it a popular location for large groups renting both yurts. Star’s Perch Yurt sits in between two other yurts and is a short distance from the lodge. The yurt sleeps eight people and has a wood-fired sauna that is open to all yurt guests. Fully equipped with essentials, games, books and lovely views, Star’s Perch is a cozy haven within a winter wonderland. Tucked away from the other yurts on a ridge behind the lodge, Honeymoon Yurt is named for its cozy, quiet location. Great for a romantic night for two or an adventure as a family of four, the yurt has two double futons, a wood stove and plenty of games to stay entertained. This is also a dog-friendly yurt, but be advised that not all surrounding trails are open to dogs. 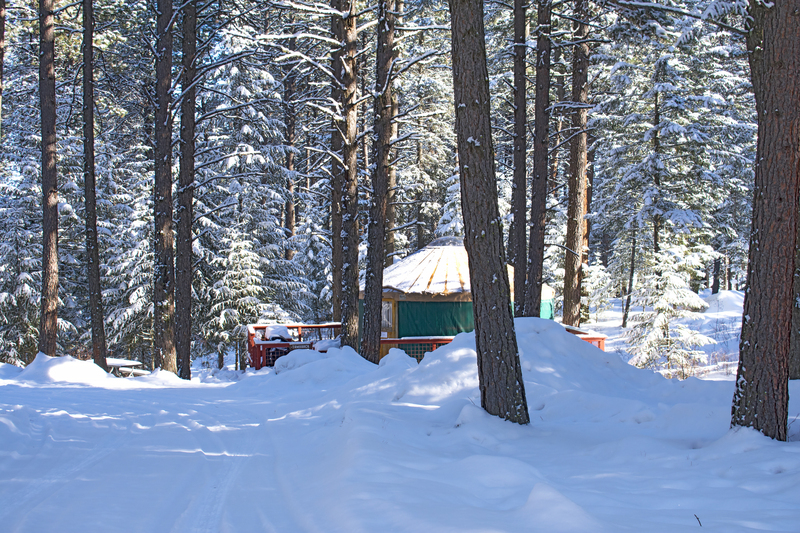 Located just off Jenny’s Way Nordic Trail, The Miner’s Yurt is ideal for a remote rendezvous. The yurt is dog-friendly and can sleep up to eight people. There are several trails that can be accessed from the yurt, making for great snowshoeing and skiing. Miner’s Yurt also has a deck that offers spectacular views overlooking the area. Enjoy the stars at Stargaze Yurt. Photo Credit: Idaho Department of Parks and Recreation. 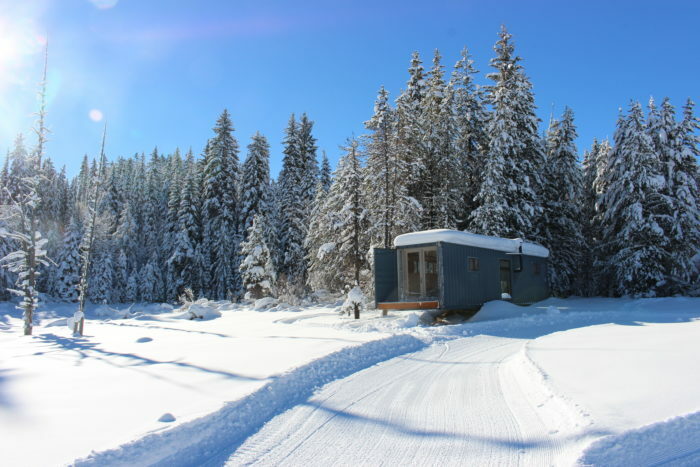 Experience a winter night under the stars in one of the Idaho City backcountry yurts. Up to six people can sleep comfortably on two bunk beds and a futon located within each yurt. Each yurt has a table, wood stove, cooking and dining utensils and cleaning supplies for use. Outside, there is a primitive toilet, fire pit, woodpile, and snow shovel available for guest use. Plan for a two to three-mile snowshoe or ski trek to access the yurts. Once your alpine adventure is complete and you head back to civilization, make time for a stop at The Springs in Idaho City. You’ll return home feeling warm and rejuvenated after a healing soak in the natural hot pools. Situated on a high knoll encircled by pine trees, Skyline Yurt is a favorite for winter wanderers on snowshoes or Nordic skis due to its close proximity to Skyline Loop – a groomed 5.2-mile Nordic track. Several peaks can be seen from the yurt and the surrounding open terrain makes an excellent spot for backcountry beginners to test their skills. Traveling with a four-legged family member? Rocky Ridge Yurt is one of the few dog-friendly yurts in the Idaho City system and is accessed from the Whoop-Um-Up Park N’ Ski parking lot. The yurt is situated on the end of a rocky finger ridge with a superb snowy playground surrounding it. Be advised that trails to and around the yurt are not groomed, so be sure to plan accordingly. This yurt didn’t get its name at random. Located on an open point at an elevation of 6,569 feet, the yurt has incredible views and offers easy access to slopes for skiing and snowboarding and wooded areas for off-trail exploration. For an adventurous night trek, head up to Stargaze Point above the yurt for next-level stargazing. 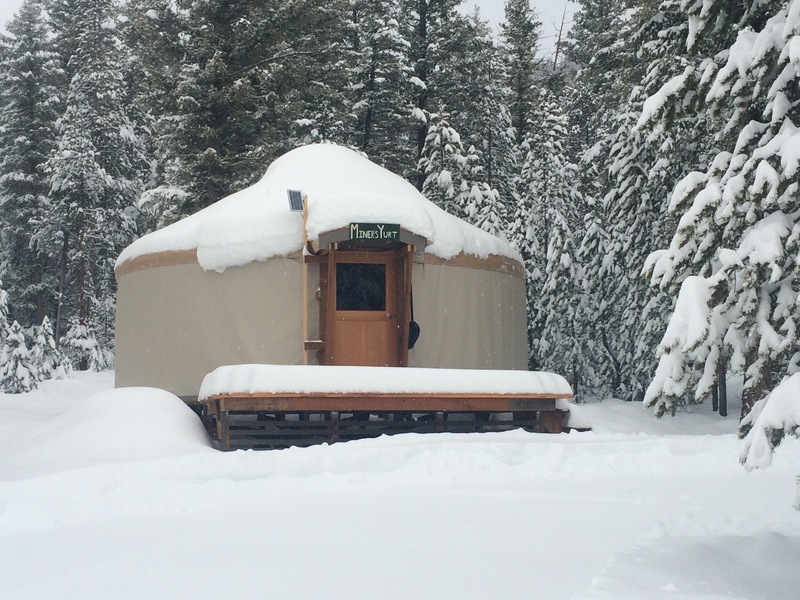 Banner Ridge and Elkhorn Yurt are also part of the Idaho City Yurt collection but will be closed for the 2017/2018 winter season. Try a new twist on winter fun at this shipping container turned alpine cabin. Photo Credit: Jug Mountain Ranch. On the shore of Upper Jug Creek Reservoir in McCall, a cozy cabin adventure is waiting. The Alpine Cabin (a converted shipping container) at Jug Mountain Ranch is ideal for exploring miles of surrounding trails on snowshoes or skis and the views overlooking the reservoir make for an unforgettable sunrise. The cabin can sleep up to seven people and is equipped with essentials like cookware, a wood stove, lighting, water and cleaning supplies. Guests will need to pack sleeping bags, snow gear and food, which can be packed in on snowshoes or brought in by Jug Mountain Ranch Staff. Vehicles are not permitted at the cabin, allowing guests to have a remote, relaxing Idaho adventure. Find snow for days with a stay at one of the yurts or huts from Sun Valley Trekking. Photo Credit: Sun Valley Trekking/Facebook. Sun Valley Trekking operates six huts and yurts in the Sawtooth, Smoky and Pioneer Mountains outside of Sun Valley. 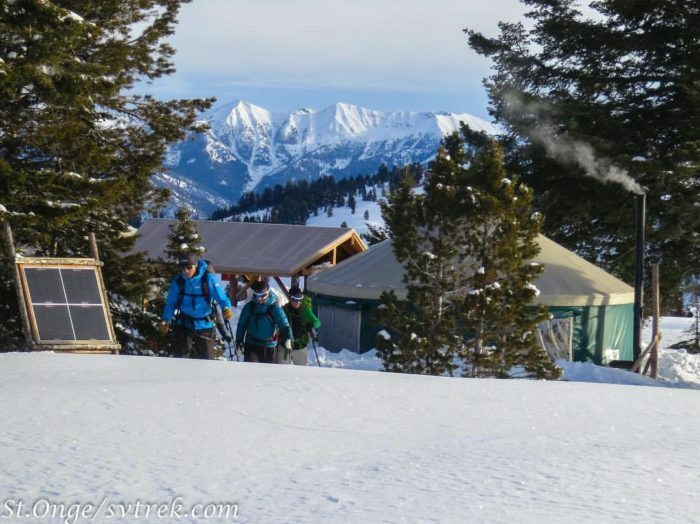 The yurts have quickly become known for being an epic hut-to-hut ski experience. Each structure is outfitted to keep guests cozy through their stay with a wood stove, bunk beds, kitchen items, solar-powered lights, books, magazines, and board games. Pack up your crew, sleeping bags, a few favorite winter comfort foods and hit the road for an unforgettable weekend in woods. Resting 7,400 feet high on the shoulder of Mount Heyburn, Bench Hut is a large wall tent that is equal parts comfortable and picturesque due to its built-in windows and stunning mountain views. Up to eight people can sleep comfortably in the Bench Hut, which can be rented as a single group or shared with another reservation. The hut also has an on-site sauna to help you thaw out after a day on the slopes. This two-structure adventure is for the advanced backcountry explorers. While the hike in is mellow, there is easy access to sizable slopes on the Sawtooth peaks just above the yurt. Fishhook Hut consists of a Mongolian-style yurt and wall tent connected by a lodgepole pine framed walkway and stays warm all winter thanks to two wood stoves. If sitting by the fire doesn’t cut it, head out to soak under the stars in the yurt’s outdoor hot tub. Better known as the gateway to the backcountry, Pioneer Yurt is situated on the edge of an alpine meadow near Hyndman Creek offering views of the incredible Sawtooth scenery surrounding the area. Those that are looking for a surreal snowshoeing or Nordic skiing experience can head out to explore in any direction from the yurt. One of the most popular destinations, Boulder Yurts is perfect for groups of up to 14 that have varying interest and ability in snow sports. These two yurts are conjoined by a framed annex and are accessible via a 1.5-mile hike in. All amenities are provided including two wood stoves, propane cooking stove, and charcoal grill, as well as added comforts like board games, books and a wood-fired sauna. One of the highest and most remote yurts, Coyote Yurt is best suited for those with some backcountry experience under their belt. These two yurts are surrounded by a variety of different terrains, from mellow powder bowls to steep descents for backcountry skiers and snowboarders. While the hike is just 6 miles, it can be a tricky route so first-timers are encouraged to hire a guide. Up to 19 can sleep in the two yurts and all necessary amenities are available for guest use. Tornak is a spacious wall tent situated at 8,400 feet in the Smoky Mountain Range. This hut was recently remodeled to accommodate adventurers with physical restrictions and is now barrier-free, allowing wheelchairs enough room to move around the space. In addition, the hut can be accessed via trail, snowmobile, snowcat or helicopter. Whether you’re seeking snowy solitude or in search of a mountainside adrenaline rush, Idaho’s yurt options have you covered.